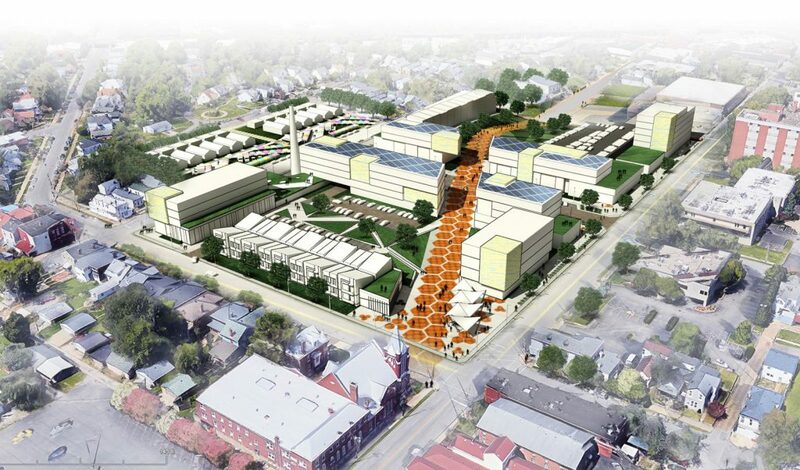 LOUISVILLE, Dec. 20, 2017 — Louisville Forward announced that Louisville’s The Marian Group has been selected today to redevelop the 12-acre former Urban Government Center for a city-owned, mixed-income housing and commercial development to include townhomes, shotgun-style single family homes, multifamily rental units and condo flats. EOP is the design lead for the development that will also include a Family Scholar House campus and a mix of senior and affordable housing alongside office and other commercial space, including the possible development of a boutique hotel. “Our goal is to deliver a dynamic development that will ultimately contribute to the economic and cultural viability of the neighborhood,” Ben Simmons, AIA, project manager and EOP associate remarks. The team includes a collaboration between The Marian Group, EOP, Work Architecture + Design and CARMAN. The development will include a Family Scholar House campus.